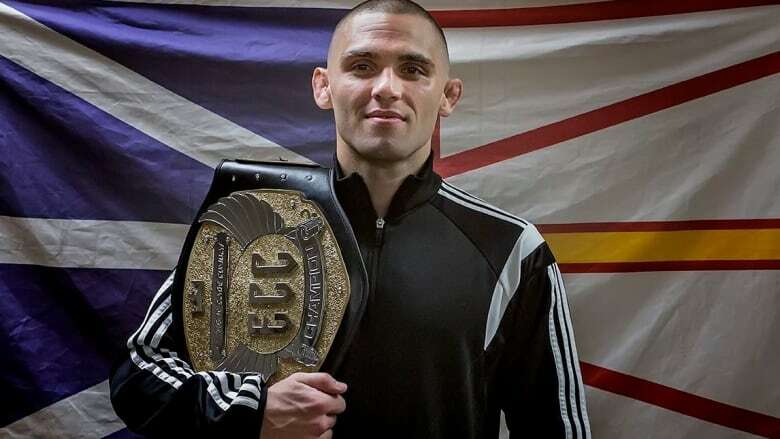 Newfoundland's Gavin Tucker defended his featherweight title in Halifax Saturday, while Nova Scotia fighter Andrew Thomas upped his amateur MMA record. Newfoundland's Gavin Tucker defended his featherweight title in Halifax on Saturday with a first-round knock out of Chris Coggins. Tucker, who trains out of Titans MMA in Halifax, caught Coggins (SSF Submissions Academy) with a head kick early in the fight and followed him to the ground, quickly forcing a referee stoppage. The Ship Cove, N.L., fighter ran his record to 9-0. Extreme Cage Combat (ECC) put on the mixed martial arts fight card at the Halifax Forum. Earlier in the evening, East Preston, N.S., fighter Andrew Thomas exploded across the cage to take down Marc Hebert en route to a first-round TKO. Thomas improved his amateur MMA record to 5-1 with the stoppage via ground and pound. "I knew he was a karate guy — he's bouncy — and he submitted his last four opponents. But I know I'm better on the ground," Thomas told CBC News after the fight. "Nobody has a wrestling level like I do in this Atlantic region." Hebert came out with a kick, but Thomas countered with a cross punch and got inside to throw Hebert to the ground. Thomas showed off his wrestling background as he controlled Hebert before getting a full mount and the ground-and-pound win. "I wasn't surprised. I knew it would go that way," said Thomas. "That's how I visualized it." He said the 12-week training camp at Titans MMA paid off. He's eyeing the pro ranks, but wants amateur gold first. The night started with Jake Kelly, fighting out of Newfoundland Defensive Arts, taking on Dartmouth's Charles Haskett. Kelly won via a rear naked choke in the first round. In the second fight, Jake Reid overcame a tough first round from Pictou's Liam Walsh to win in the second round via TKO. The heavyweights stomped into the ring as Don Wonch, of Rumble Academy, squared off against Kris Lee, of Foley's Academy of Martial Arts. The two exchanged strikes before the fight went to the ground. Lee sunk in a deep guillotine choke, forcing a first-round tap for the win. In the co-main event, Halifax's Ryan Potter, of Abahya MMA, stepped into the cage against Alex Paul, of Evolution, fighting out of St. Mary's First Nation, N.B. Paul looked in terrific shape as he took the fight to the ground to deliver brutal elbows, forcing the referee to stop the fight.